Let us embark on a journey to restore the stars in the sky! Clean up the house by rolling up everything in your way! You must know everything about the house now! There are so many new things to discover in the new world! Collect lots of things and make the town beautiful again! A world bigger than the town! Can't wait to see what is in store for us! 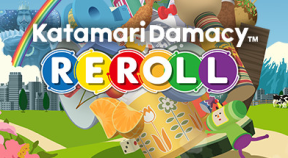 Look at you rolling that Katamari. So cool! We can count on you to guide us around the town! You now have the world in the palm of your hands! Treat it like it is your very own backyard! Finally the moon is restored! You are a true professional roller! Beautiful and elegant like a white swan in a lake! Collect as many crowns as possible to become gorgeous! Roll up the beautiful maidens in order to pursue true cuteness. Collect the twins that are always together to make a family twice the size of others! Moo!! It's hard finding the perfect cow! Follow the North Star and you will never stray from your path! Make sure to collect all the presents from the King! You are the true King of Rolling! Amazing!